Prosecutor Michael T. Gmoser is doing his part to help with Butler County’s struggling financial difficulties. 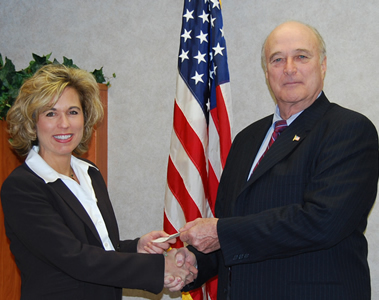 Prosecutor Gmoser met with Treasurer Nancy Nix this morning to return $1,901.97 to the County’s general fund. The money is compensation Gmoser received during his tenure as Interim County Prosecutor. This is not the only contribution Prosecutor Gmoser will be making to help County finances. He also has opted to be a full-time prosecutor, while being compensated at a part-time pay level - saving the County an additional $37,386 annually. “As our County struggles to make ends meet, I want to do everything I can to contribute towards a solution - while at the same time, assuring Butler County residents that my part-time pay status will not affect the level of professionalism or hard-hitting prosecutions residents have come to expect and deserve from our Office,” Prosecutor Gmoser concluded.